Inside a book store, we see a nice display, don't we? It is good to offer merchandise designed to attract a younger audience. Then, we have to find a younger audience. It's really hard to do that within a framework designed to attract the loyal, core customer. Perhaps it was really targeted to adults who needed a recommendation for what to buy a teen. Maybe, but that doesn't fit my narrative! What's the solution? In this scenario for instance, with teens embracing newer technology like tablets is that where they're doing their reading? Or are they just gettign the books from online sources? 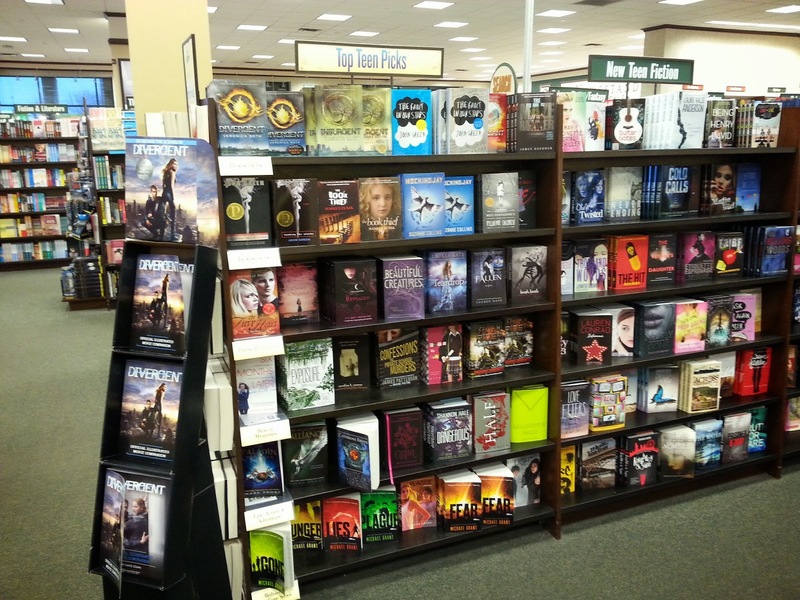 I don't believe that teens aren't reading because the Young Adult genre is bigger than ever. If tablets are the chosen medium what can bookstores do to get young readers to come to them, engage them in social media, work with the publisher to offer incentives for buying the hardcopy that doesn't come with the digital copy? Do publishers even care as they will be getting paid either way? I agree that this is a problem, you can't just set up a display and hope that new customers will see it, but I'm not sure what the solution is at this point as book stores become more and more niche, Amazon or tablet works best for most people. I'm not sure there has to be a solution - or that the solution has to be connected to anything that is currently happening. Go out to Wattpad, there's hundreds of thousands of young readers/writers out there - that might be the solution, and it is possible it has no connection whatsoever to modern brick 'n mortar. Or I could be completely wrong and there should be a retail-centric solution. That's the fun part of this stuff - nobody is right.